Useful Knots and How to Tie Them - Plymouth Cordage Co.
Reminiscences - Ed Dart, Publicity Chairman, M.D.A. Coloring Changing Rabbit - Inzani-Henley Magic Co.
Conventionitis, Etc. - Ed Dart, Publicity Chairman, M.D.A. Abbot-Tempo - Abbott's Drug Co. The Happy Season - Ed Dart, Publicity Chairman, M.D.A. The Mummy - Inzani-Henley Magic Co.
How's Tricks? - Ed Dart, Publicity Chairman, M.D.A. 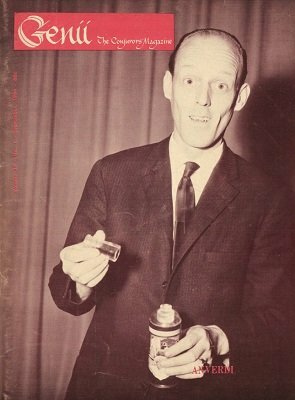 1965 For Enthusiasm - Ed Dart, Publicity Chairman, M.D.A. Magic and Sociability - Ed Dart, Publicity Chairman, M.D.A. Cover - Louis St. Pierre, Sr.
Our Cover - Louis St. Pierre, Sr.
Review of Show of Harry Mendoza At Azusa, Calif. Kiwanis - C.M. Conventions & Others Germs - Ed Dart, Publicity Chairman, M.D.A. Magic Critics and Cynics - Boosters and Backers - Ed Dart, Publicity Chairman, M.D.A. Magic and Mags. - Ed Dart, Publicity Chairman, M.D.A. All Aboard For Fun and Conventions - Ed Dart, Publicity Chairman, M.D.A. The Magic of Paper - Ed Myers & Parson Paper Co. It's Not A Mystery To Me - Ed Dart, Publicity Chairman, M.D.A.